Ageing skin, or skin requiring rejuvenation. – Not recommended for extremely sensitive skin types (i.e. rosacea or very dehydrated skin. Counteracts skin aging and improves the appearance of UV damaged skin. Use only under supervision of a skin care professional. Note that each individual may metabolize Vitamin A differently. A period of acclimation to this strength of Vitamin A may be necessary. See recommended use schedule below. Apply small amount on entire face and neck between 9 and 11PM. 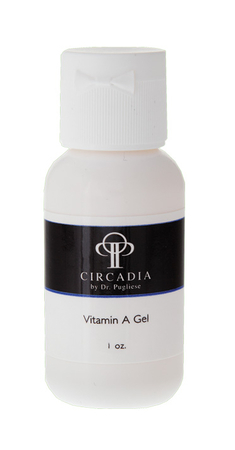 Allow the skin to rest; use Hydrating Cream in place of Vitamin A Gel. Alternate 3 nights on and then 4 nights off for six weeks. The goal is to build tolerance so that client can use product consistently for 5 nights without signs of dryness or irritation. NOTE: Do not use if erythema is present. Discontinue if irritation occurs. If excessive erythema and flaking occur, reduce frequency of use. If no improvement after one day, discontinue use completely and see your skin care professional.